Welcome to the new season 2018! i'll copy here the posts about this season so hang on a while till i'm finished. Jānis Ķuze wrote: Par melno stārķi - būvēšanas darbus plānojam veikt šo piektdien. Ja viss ies, kā plānots un nebūs pārsteigumu tehnisku ķibeļu veidā, nākamnedēļ šai ligzdai vajadzētu būt "gaisā". We plan to carry out construction works this Friday. If everything goes, as planned and there will be no surprises in the form of technical kits, next week, this nest should be "in the air". On 13 Mar 2018, 16:25 Dagmar wrote: Thanks Liz! Somehow I missed the connection. We have 5 owlets in the nest. I am completely in love and almost can not see what is happening around me. 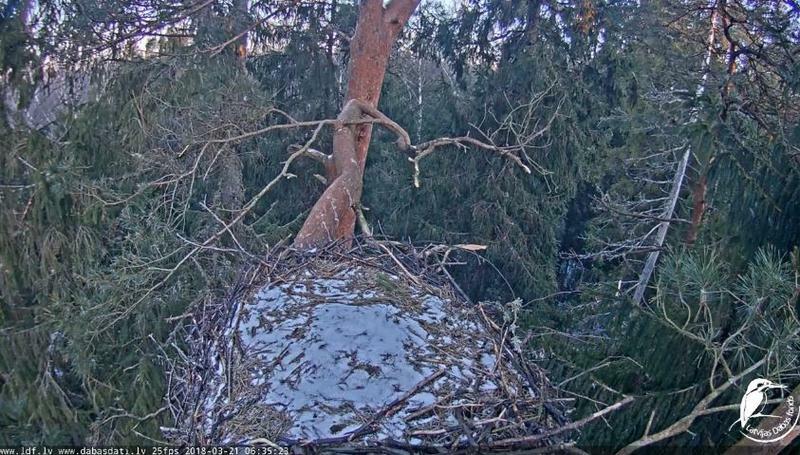 The nest of the Black stork is located in the middle part of Latvia in Sigulda County. It is found before two years. The breeding area is known already since 1982. 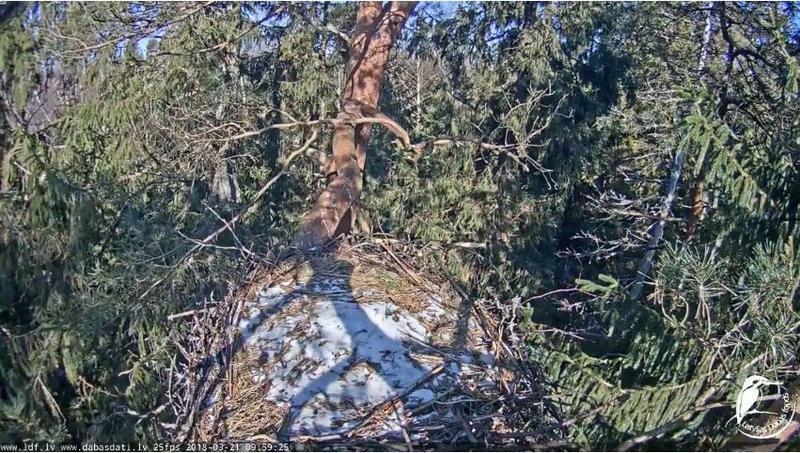 In 2005 previous nest was predated by marten, and, most likely, birds moved to the current nest afterwards. 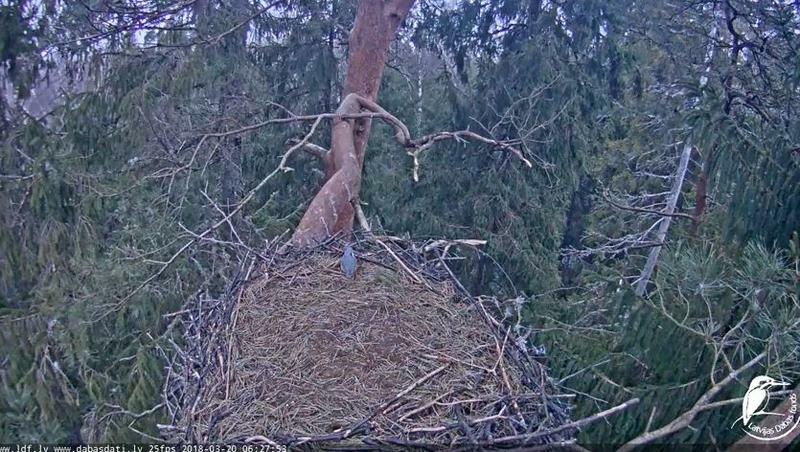 This nest has been built in a pine, on the branch 1.8 m from the trunk. It is located in boreal pine-spruce forest of an age between 150 and 200 years. 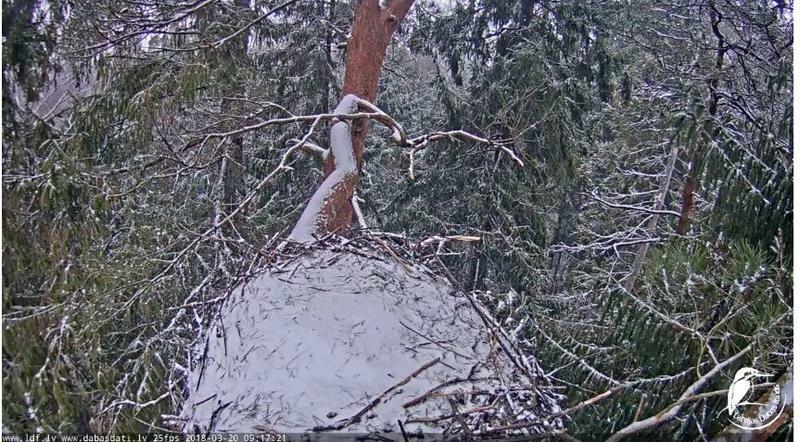 In 2017 a trail camera was installed at the nest. Four nestlings hatched and three of them fledged; the last fledgeling left the nest late in the season - on September 6, presumably due to belated start of breeding. The webcam is installed on 16 March 2018 by Jānis Ķuze, Jānis Rudzītis, Māris Strazds and Eduards Ozoliņš. On 20 Mar 2018, 10:11 baska wrote: Super ! Thank you for the hint ! And TY for the news of Gallipo, Solo. 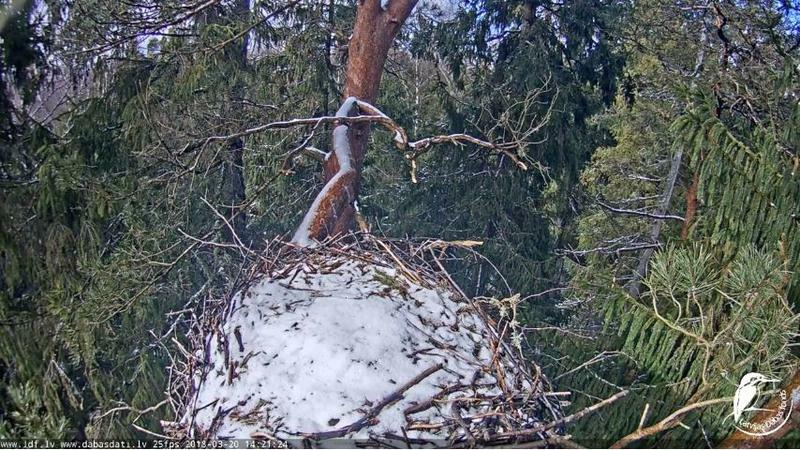 They had the second egg already yesterday. ok, here are copies of the posts which a relevant for the season 2018.
i saw that Liz has copied the introduction from the Youtube above. thank you! now all we need are storks to arrive. That's a bit difficult. Difficult because they have no rings. But by careful observation, I'm reasonably sure in the data. EDIT 2018-04-13 ..is better it is on the first page. So we can find it easier. Thanks for the new Camera Thread 2018. I'm looking forward to the new observations. M.S.....Nest - this year they won't do anything since it makes no sense. It has been fallen down before this year at least twice - and has been restored in the same place. After winter nothing may remain there - if support branch remains, they might rebuild it within a few days. May not. This is actually very interesting document to see how it happens - as it has happened repeatedly in other nests too - exactly around the time of departure and in some cases has caused departure. It is obviously a good indicator of poor nest site (location in tree) wich in turn is indication of lack of good sites altogether. This behaviour happens again and again when some juveniles are in nest and some other juvenile arrives - what is important is the voice. I've never heard such one in other conditions. There is a very interesting article by Maris Strazds on Goris. Distinguishing marks male and female. Solo, I was not awake this morning! It's good that you have set the Facebook link here for other members it is important to have the link! 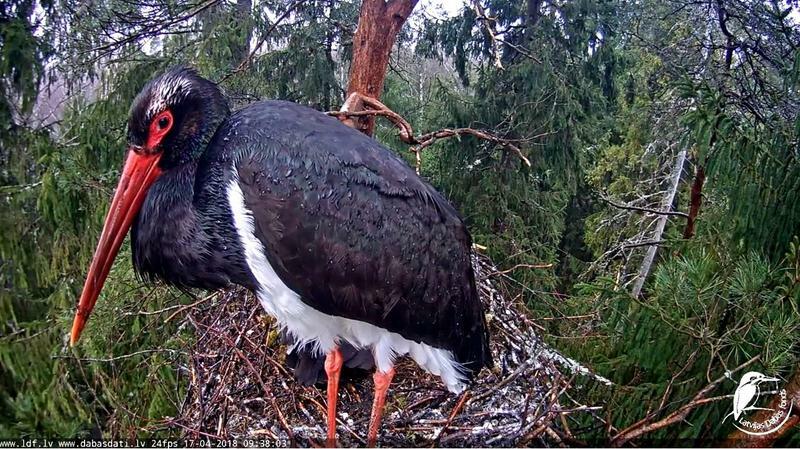 have a question: is YouTube the only source to observe the black storks nest ? No direct stream available ? the latvian cameras are all only on youtube available. It's great to be together with all of you in this new season.